Gord Nixon, Com'79, LLD'03, knows how to lead a team – whether it is on the field or in an office. He won a championship as a player with the Gaels’ men’s rugby team during the 1978-79 season. A few decades later, Dr. Nixon was involved in another big win for Queen’s when he served as chair of the Initiative Campaign, which saw $640 million raised to support the university’s students, researchers and programs. He spent 13 years as CEO of RBC, Canada’s largest bank, before retiring in 2014. During his tenure, he dramatically increased the company’s profits, successfully led the company through the 2008-09 financial crisis, and was named one of the 30 Best CEOs in 2010 by Barron’s newspaper – a list that included Steve Jobs (Apple), Jeff Bezos (Amazon.com), and Warren Buffet (Berkshire Hathaway). Dr. Nixon’s impressive career and dedication to Queen’s are among the reasons he is being honoured with the Alumni Achievement Award, the highest honour bestowed by the Queen’s University Alumni Association (QUAA). “It’s a real honour and very special to receive the Alumni Achievement Award. Queen’s was a big part of my life and something I am very proud of,” says Dr. Nixon. Past recipients of the award include some of the university’s most accomplished alumni: Shirley Tilghman, Arts'68, DSc'02 (Princeton University’s first female president); NASA astronaut Andrew Fuestel, PhD’95; and Governor General David Johnston, Law'66, LLD'91. Kim Sturgess, Sc'77, LLD’16, served as vice chair of the Initiative Campaign and praised Dr. Nixon’s leadership skills. Queen’s is a special place for Dr. Nixon – he met his wife Janet Nixon, Com’80, on campus. 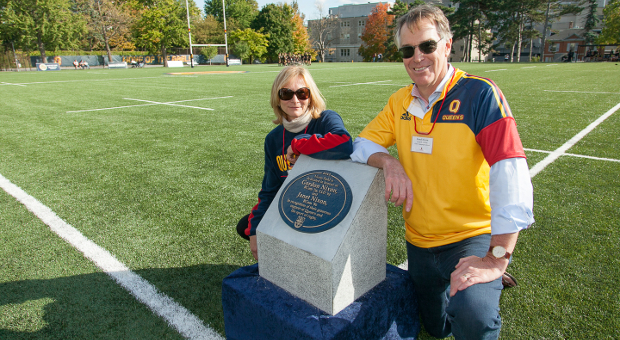 Together they remain close to Queen’s, having recently made a significant donation to revitalize the campus rugby field. Nixon Field – located beside Grant Hall – is named in their honour. “The university means a lot to both my wife and me. It is a wonderful institution with incredible programs. The ability to invest philanthropically into a university that does so much for so many of its students is extremely important to us,” says Dr. Nixon, who also served on the Smith School of Business Advisory Board before stepping down last year. Dr. Nixon will be officially honoured with his Alumni Achievement Award at the QUAA Gala Dinner on April 8 at the Isabel Bader Centre for Performing Arts. Online registration is now open.